Toby Bluth Handsigned and Numbered Limited Edition Hand Deckled Giclee on Paper:"Top of the Stairs"
Just as those five films marked Walt's grand entrance into feature length storytelling they, quite appropriately, set the stage for the first five limited edition giclées in Bluth's Disney Fine Art portfolio. Infused with all the depth, texture and richness of Toby's original watercolors these fine prints will be enjoyed for generations, very much in the spirit of the timeless classics that inspired them. 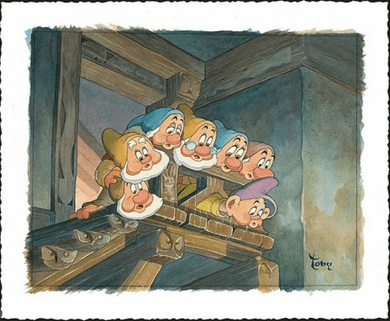 Inspired by the work of legendary illustrator Gustaf Tengrenn, whom Walt Disney recruited to work on Snow White and the Seven Dwarfs, Bluth is passionate about his craft. A multifaceted artist, Toby's creative endeavors do not end at the tip of his brush. He is an accomplished writer, director, designer and a veteran of the American musical stage, having performed and or directed in nearly one hundred musicals, both on Broadway and beyond. Most recently he served as Art Director for The Walt Disney Studios production of The Three Musketeers, having already served in that position for the animated feature film The Tigger Movie.